Tucson-based architect Rick Joy has been practicing for a quarter of a century. In that time his "cooperative practice," Studio Rick Joy, has evolved from single-family houses in the region to the same across North America and larger commissions, some of them public. 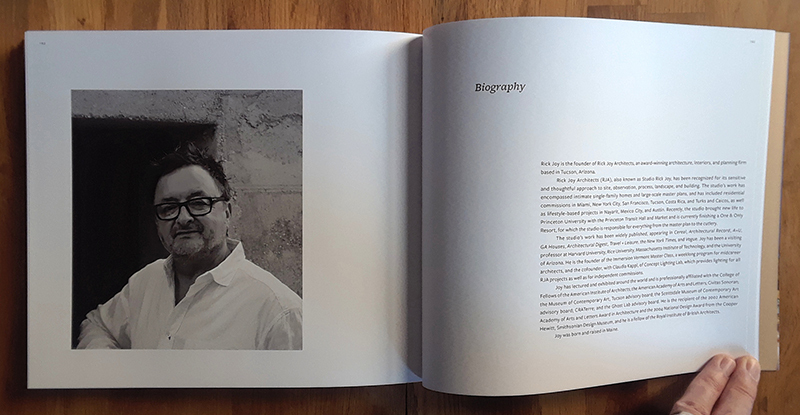 Even with this evolution, which parallels the career paths of many successful architects, his "desert works," to take the phrase from his first monograph, stick in the mind of those, like me, who appreciate his work. 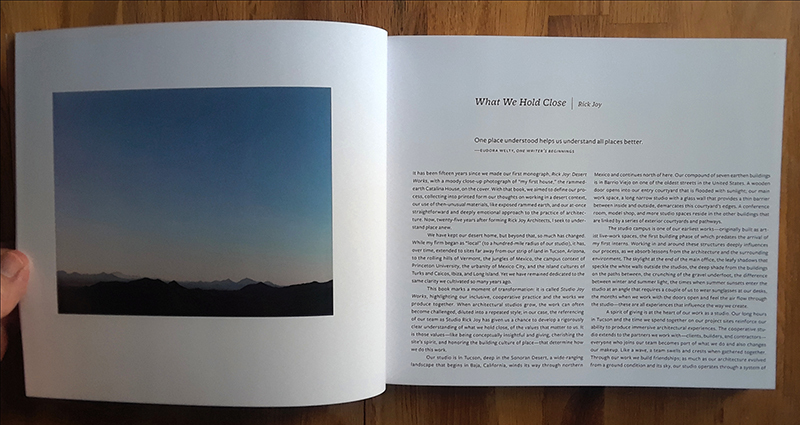 With rammed earth walls and carefully placed apertures for framing views and introducing natural light, projects like the Catalina House (gracing the cover of 2002's Rick Joy: Desert Works) impress with almost primordial qualities, with spaces that appear to embed inhabitants, both figuratively and literally, within the landscape. Those same qualities are exuded on the cover of Studio Rick Joy, but the setting and typology are quite different: the stairwell is part of Tennyson 205, a five-story apartment building in dense Mexico City, a far cry from the remote settings of his desert houses. 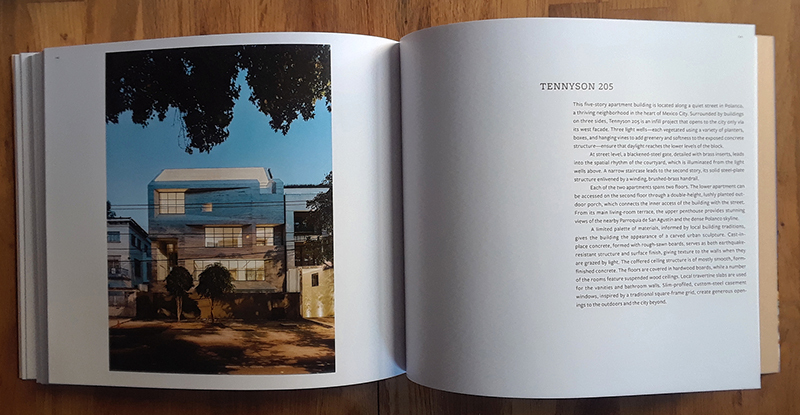 What the cover and other photos documenting Tennyson 205 reveal is that Joy and his cooperative practice have managed to retain the characteristics he defined in his desert works and refine them to other places and types of spaces. The same could be said of the Princeton Transit Hall and Market, the only Rick Joy project I've seen in the flesh. Although the two-building project does not hold the same drama or mystery as buildings like his own studio, it has a certain quiet and embrace that make it a pleasing place to wait for the Dinky, as the short branch serving Princeton University is known. 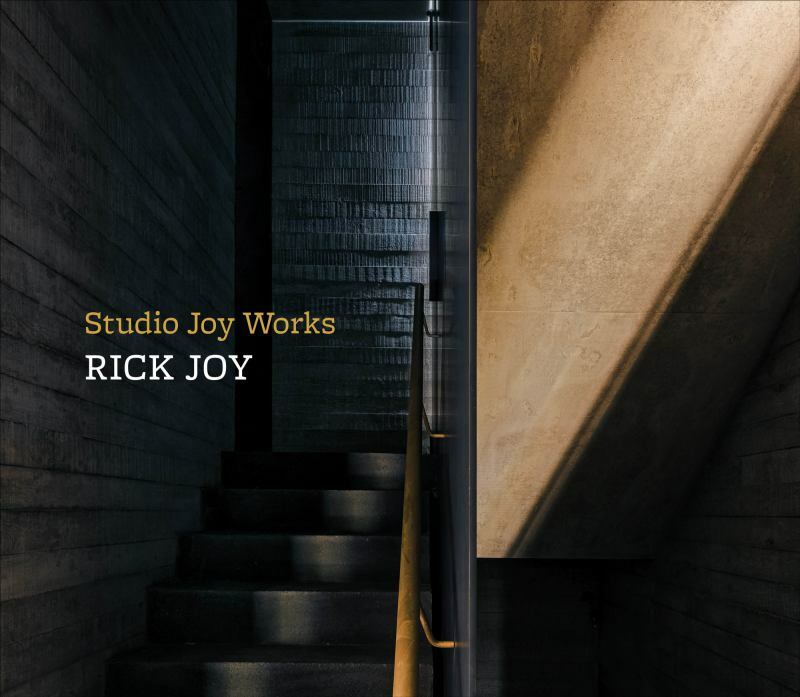 With 13 completed projects, ranging from the Adobe Canyon House to Princeton, Studio Rick Joy lets readers trace Joy's career to date, grasping the many differences ― and many consistencies. Rick Joy is a Tucson, Arizona-based architect with an international reputation for designing timeless modern houses deeply grounded in place. He lectures widely and his work has been published around the world.